Every surfer mum and dad wants their kid to surf. But it can be a difficult mission, especially if you surf in cold water. To help you teach your kids to surf and avoid the mistakes I’ve made, here’s some tips and advice I’ve gathered along the way. 1. Teach your kid to swim. The earlier the better. It’s great quality time, could potentially save their life and will help them become confident surfers. 2. Lower your expectations. Unless you get paid to surf it’s unlikely you’ll have the time, skills or lifestyle to train your child to be a pro surfer in one summer. 3. Be patient. If they don’t want to go surfing or want to get out after 5 minutes let them. There’s always a next time. Force them, and there might not be a next time. 4. Practice the pop up. There’s a lot to think about in a short space of time when catching a wave. Practice the difficult bit, standing up or ‘the pop up’, out of the water. 5. Keep it fun. Teach them to enjoy wiping out. Praise them regularly. Laugh and smile. If it’s not fun, why do it? 6. Start when the waves are flat. A ripple is enough to get started and a two foot wave can be terrifying if you’re only 3ft high. 7. Keep your kid warm. Get a quality, 5mm wetsuit and boots if you surf in cold water. A cheap wetsuit will rub and they’ll get cold in minutes. If you surf in tropical waters, no problem. 8. Go with friends or family. There’s nothing like peer pressure to motivate a child. If a friend, sibling, cousin or other child a similar age is doing it, your child is more likely to join in. 9. Go on a surf holiday. Ideally you want warm water, beach breaks and gentle surf. Gnarly urchin infested reefs are a no-no. 10. Go for a joint surf lesson. You’ll learn some of the techniques for teaching, and it puts you on an equal level. Or at least somewhere where the water’s warm and kids are surfing. My parents took me to Hawaii when I was six, tried surfing and never stopped. The best surfer is the one having the most fun. To have fun you have to be safe. Being safe means choosing sensible equipment for your level and waves that suit your level, recognizing your limits, but also fuelling your ambitions to ride in new places and breaks that allow you to both enjoy and improve, but not get intimidated. Once all those ingredients are there, waves and surfing will carve an unforgettable smile on your face until the sun tips whole into plum-coloured sea, and you are the only one left out, already planning the dawn patrol. But surfing isn’t just about being in the water. Learning to read the ocean is key, studying weather charts and spotting rip currents. Observe. Where are the crowds, where is the access? Where are the biggest and smallest waves breaking? What are the dangers? Where are they? Treat the beach as an exciting classroom to ‘learn through surfing’. And at home, practice the pop up in the living room, and watch your heroes surfing in surf films to be inspired by their style. My daughters are 13 & 11, they enjoy boogie boarding, but have little interest in surfing. I did give my 13 year-old nephew a lesson this summer and by the end of the day he was catching whitewaters and standing up. My daughters did find this curious, and I bet I’ll get them to try it this summer. In my experience the keys to learning to surf are having the right board and mastering paddling. I would tell someone to put the time in in the whitewater, stay there until getting to your feet is a sure thing, and learn to paddle. The better a paddler you are the easier it will be to catch waves. So much of the time we see a beginner, on a board too small, stroke to the outside, then flail around. Learning to surf is all about catching and riding waves, and catching waves is all about paddling. If you’re not catching waves, you’re not learning to surf. That said, I think for kids it’s best to make the experience as fun as possible with as few a mishaps as possible. Try and keep the pearling to a minimum. Learn more about Bruce’s youth as a surfer from his (mostly) fictional book Pier Rats. Tyler and his son Nolan charging the ‘hang on!’ approach. As for tips I would say just don’t push past your kids willingness and keep everything positive and fun or you may scare the little ones further away. On the flip side if your kid is just a little nervous you may have to get your kid out there and show them that it’s nothing to be afraid of. It’s just about the lifestyle your kid wants to live. 1. Let them play and gain a sense of fun before giving them too much technical ‘instruction’. 2. Teaching your children to surf follows the same rule as trying to teach your children to drive, don’t do it! Pay for surf lessons. 3. You have surfed Nias at double overhead, got barrelled at Pipeline and towed in at Nazarre but in your children’s mind they still know more about surfing than you. In addition to surfing wisdom, Jock offers amazing yoga retreats near my favourite surf spots in Cornwall. I’m no expert believe me – in fact I only started surfing myself 18 months ago and asked my daughters if they wanted to do it with me – the youngest one was keen the older one not so much. I certainly think getting them to try it at a young age is key – I really wish my folks had done something like this for me as I’ve wasted a good 30 years not knowing the joy of surfing. My daughters follow the classic first child and second child characteristics – as parents you worry and fuss a lot over the first child because it’s new and scary, by the second it’s more relaxed and that I think reflects in the children’s personalities. 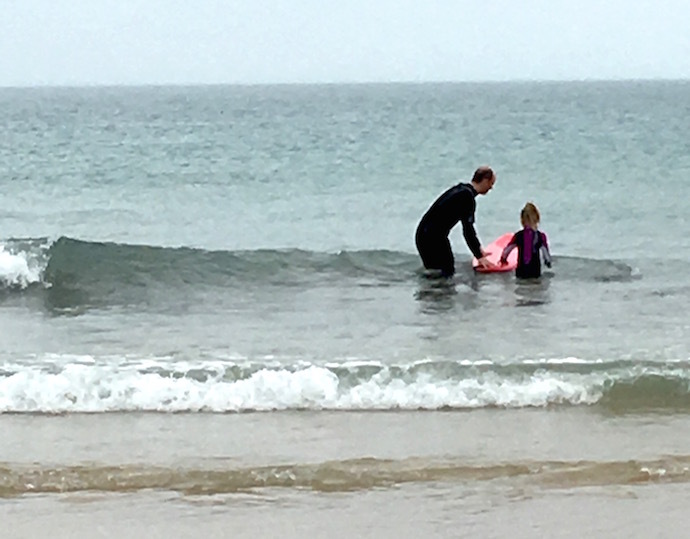 I’m still working on my oldest girl as she’s a really strong swimmer and I think she’d be a good surfer – just need to get her past the whole getting changed in the back of a car or in a car park – we surf in Portrush in Northern Ireland so it’s cool enough at times in January in a car park. @surferdaduk and never ever panic. @surferdaduk Practice their pop into standing position, or if more comfortable pop into a knee position first to gain balance. Good luck! I will continue to slowly train my future No.1 best surf buddy and ask every surfer Mum and Dad I meet for their top tips along the way. In the meantime, please share your tips for teaching kids to surf in the comments below. Great tips! I’d also say to get a soft board e.g. ‘Swell’ as their nice to lie on and don’t hurt to much if you get hit! Ah yes, forgot about that. I’ve got a soft top for my daughter. They’re a lot lighter and safer than the lethal pop-out I learned on. Thanks for taking the time to read the post and share your tip. Cheers David. It’s tricky when you love something so much and want your kids to feel the same. My husband has taught all his 8 nieces and nephews to surf. 15-20 years later, 2 have become life long surfers and 4 more will surf when the opportunity presents itself. But when it comes to our own kids (10,12,16,18), it hasn’t happened quite like he hoped. They all love the ocean/beach (thankfully!) but aren’t too keen on surfing. The oldest 2 are finally showing a bit of interest and even took some boards down to the beach one morning recently where they watched the sunrise with friends and then hopped in the water for an early morning session. From our experience, I’d say don’t push it on the kids. I think my husband was a little too eager and pushed the kids harder than he should have. Let them develop of love of the ocean and then if they show an interest in surfing, introduce it to them in a low key way and go from there. . Funny you should say that, my nephew is the most enthusiastic of the kids I’ve helped teach surf. It doesn’t do any harm that he now lives in Sydney, but even when in the cold waters of Cornwall he was always very keen. I’ve also got a couple of good friends that have sacred their kids off surfing by pushing them too hard, so I completely agree with your advice.